Hi friends! 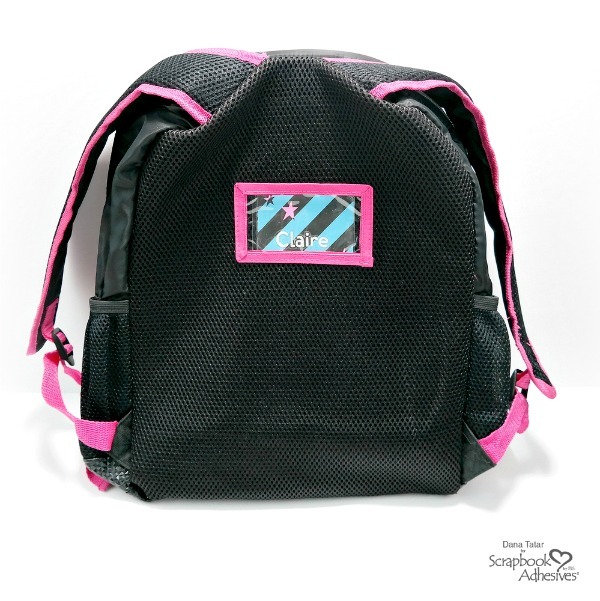 Dana Tatar here with you today sharing a quick craft idea for a child’s backpack during the back-to-school season. My family moved over the Summer, which was equal parts exciting and nerve-racking. My daughters started in a new school a couple weeks ago and I wanted to be sure to have their names somewhere on their belongings. I made way more trips to the lost-and-found last year than I liked and I’m hoping to avoid that this year. 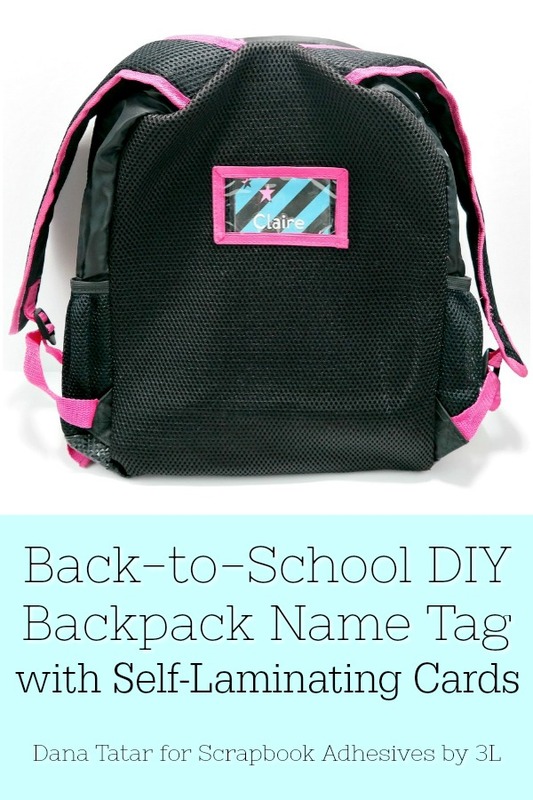 I used Adhesive Sheets and Self-Laminating Cards to create personalized backpack name tags. My daughters selected patterned paper and cardstock in their favorite colors. The cards are clear, so I was able to add contact information to the back of each card. Step 1: Cut a piece of patterned paper to fit inside a Self-Laminating Card. Be sure to cut the patterned paper smaller than the card so that the edges seal. Add contact information to the back of the patterned paper. Step 2: Remove the yellow backing paper from a 4×6 Adhesive Sheet. Align cardstock onto the adhesive. 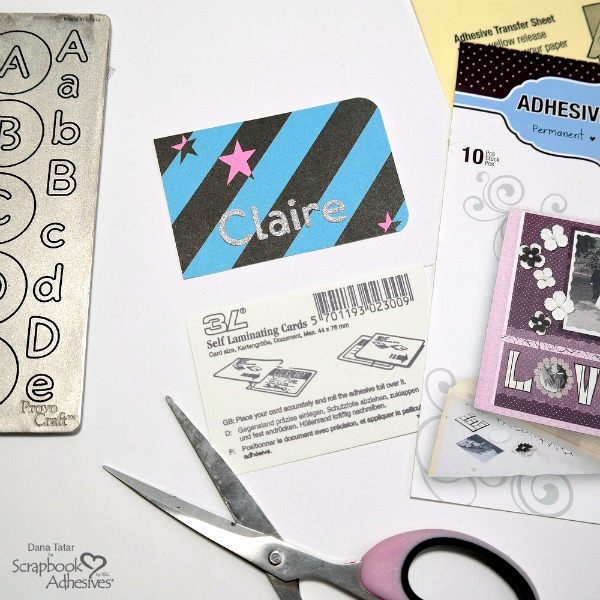 Use any die-cut machine, punches, or scissors to create letters. Remove the backing liner from each letter and adhere to the card. Step 3: Place the completed name tag inside the Self-Laminating Card. Remove the liner and press the sides together to seal. The laminated name tags fit inside the pockets on my daughter’s backpack. 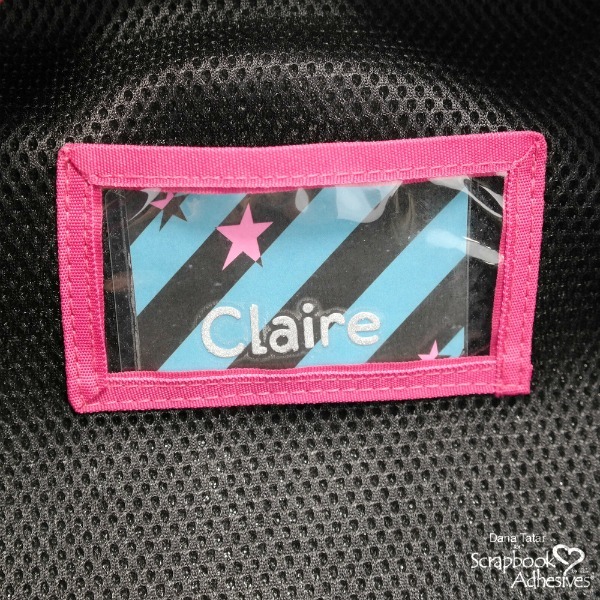 Try this project with the Self-Laminating Tags with Loops if a window pocket is not present on the bag. Thanks for stopping by today. I hope your school-age family and friends have a great year! This entry was posted in Adhesive Sheets, Beginner, Cards, Fall, Scrapbooking, Self-Laminating Cards, Wearable Art and tagged Adhesive Sheets 12x12" (25 sheets), Adhesive Sheets 12x12" (5 sheets), Adhesive Sheets 4x6", Adhesive Sheets 6x12", Back to School, Backpack, Dana Tatar, Die-Cuts, Name Tag, Papercrafts, Scrapbooking, Self-Laminating Pouch Wallet, Tutorial. Bookmark the permalink.